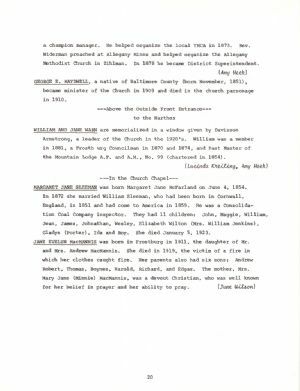 GEORGE E. MAYDWELL, a native of Baltimore County (born November, 1851), became minister of the Church in 1909 and died in the church parsonage in 1910. Armstrong, a leader of the Church in the 1920's. William was a member in 1881, a Frostburg Councilman in 1870 and 1874, and Past Master of the Mountain Lodge A.F. and A.M., No. 99 (chartered in 1854). MARGARET JANE SLEEMAN was born Margaret Jane McFarland on June 4, 1854. In 1872 she married William Sleeman, who had been born in Cornwall, England, in 1851 and had come to America in 1859. He was a Consolidation Coal Company inspector. They had 11 children: John, Maggie, William, Jean, James, Jonathan, Wesley, Elizabeth Wilton (Mrs. William Jenkins), Gladys (Porter), Ida and Roy. She died January 5, 1923.